WASHINGTON — The leaders of the Senate Foreign Relations Committee and 18 other senators have sent a letter to President Donald Trump that could pave the way for sanctions in the disappearance of a dissident Saudi journalist. Committee chairman Bob Corker, R-Tenn., and ranking member Bob Menendez, D-N.J., are leading a call to probe whether Saudi Arabia was responsible for “an extrajudicial killing, torture, or other gross violation of internationally recognized human rights against an individual exercising freedom of expression" under the Global Magnitsky Act. The lawmakers ask the Trump administration to report back in 120 days. “Our expectation is that in making your determination you will consider any relevant information, including with respect to the highest ranking officials in the Government of Saudi Arabia,” the letter reads. Any resulting sanctions would freeze any assets the individuals or entities hold in the U.S. and also prevent them from using any American financial institution for banking or other purposes. Since the United States financial system has such broad global reach, the sanctions make it difficult for the individuals to use major banks anywhere in the world. The move is a sign Saudi Arabia’s credibility with the U.S. Congress has hit a new low in the wake of reports Riyadh is suspected in the death of Jamal Khashoggi, a contributor to the Washington Post. While the lawmakers do not explicitly reference arms sales, the move also calls into question future U.S. sales to the kingdom, which seem at least for now to be frozen. Khashoggi, who has been critical of Crown Prince Mohammed bin Salman and the Saudi-led intervention in Yemen, fled the country last year. He vanished a week ago, after visiting the Saudi consulate in Turkey. 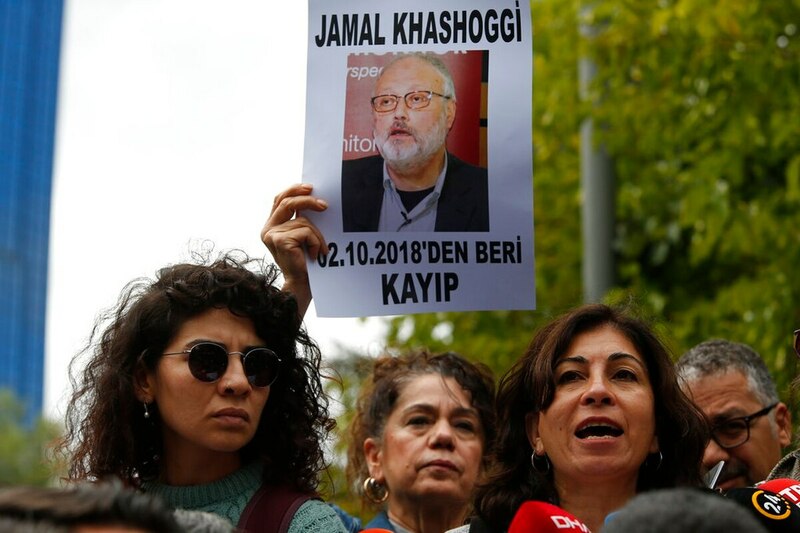 A senior Turkish official told The New York Times that Khashoggi was murdered and gruesomely dismembered with a bone saw in a Saudi consulate in Istanbul, Turkey, on the Saudi government’s orders. Saudi Arabia, however, insists that Khashoggi left the consulate shortly after he arrived. Trump and European leaders all have called on Riyadh to explain what happened. The controversy threatens to roil a U.S.-Saudi relationship that was already rocky, as far as Capitol Hill was concerned, and casts a cloud over a key market for the U.S. defense trade. Lawmakers have expressed growing concerns with the civilian death toll from Saudi-led airstrikes in Yemen. Last year, Trump touted $110 billion in defense deals with Saudi Arabia, including seven THAAD missile defense batteries, more than 100,000 air-to-ground munitions and billions of dollars' worth of new aircraft. On Tuesday, Sen. Rand Paul, R-Ky., cited Khashoggi’s disappearance to announce he would force a vote on planned U.S. arms sales to Saudi Arabia the next time the administration notifies Congress of one. “If they’re responsible ― or even if there’s any indication that they’re implicated in killing this journalist that was critical of them ― we’ve got to stop sending them arms,” Paul told WHAS, a Kentucky radio station. A Paul spokesman declined to say immediately whether the threat applies to all sales or just those linked to Yemen. Paul said he would be “forcing votes” against arms sales to Saudi Arabia, adding that he differed with Trump on the matter. “Who knows ― the president may come around on this if there’s any evidence that they killed this journalist,” Paul said. Paul could force a vote on a future arms sale under the Arms Export Control Act. He could bring the measure to the Senate floor after giving the Senate Foreign Relations Committee 10 days to consider it. Menendez has for months withheld support for a pending U.S. sale of Raytheon-made precision guided munitions. The administration is required to give Congress a 30-day notice for arms sales, and while Menendez has stretched that notification period, it would be an unusual move for the administration to bypass a senator. If the Senate were to vote on an arms sale to Riyadh for the Yemen war, the sale would be blocked, Corker told Defense News last week, even before the Khashoggi matter caught the attention of Capitol Hill. “I think if right now there were a vote to disapprove of a sale, that they would lose. That’s where I think where they are,” Corker said. The Trump administration just doubled down on Yemen, but opponents in Congress say they are getting stronger. One measure of the tension between Saudi Arabia and Capitol Hill is the reaction from Sen. Lindsey Graham, a past defender of arms sales to Riyadh, who told reporters Wednesday “there would be hell to pay” if Khashoggi was murdered by the Saudi government — though he cautioned, “we don’t want to rush to judgment." Beyond the Khashoggi matter, the Trump administration is under pressure to justify its warm relationship with Saudi Arabia. U.S. Secretary of State Mike Pompeo’s certification last month that the governments of Saudi Arabia and United Arab Emirates have taken demonstrable actions to reduce the risk of harm to civilians in Yemen inflamed lawmakers skeptical of U.S. military aid in the conflict. The certification effectively let the administration continue U.S. military support for the Saudi-led coalition in Yemen, with U.S. weapons sales and aerial-refueling support to coalition aircraft. A bipartisan group of lawmakers, led by the Senate Foreign Relations Committee’s Sens. Todd Young, R-Ind., and Jeanne Shaheen, D-N.H., sent a letter Wednesday to Pompeo expressing “serious doubt” about the accuracy of the certification and requesting comparisons of civilian casualties and deaths due to Saudi coalition airstrikes from last year to this one. America's top diplomat reportedly backed U.S. military aid for Saudi Arabia’s war in Yemen amid warnings that a cutoff could jeopardize $2 billion in Mideast weapons sales. The U.S. defense industry is surely watching how this all plays out. By far the largest recipient of U.S. arms exports between 2013 and 2017 was Saudi Arabia, accounting for 18 percent of U.S. arms exports, according to the Stockholm International Peace Research Institute. The Obama administration made the initial decision to commit U.S. military support to the Saudi-led intervention three years ago, but limited it in 2016, blocking a sale of precision-guided munitions amid concern over rising civilian casualties. Obama-era U.S. Ambassador to Saudi Arabia Joseph Westphal said in an interview Tuesday that in that case, Riyadh looked to other vendors. It was unclear how Riyadh would retaliate if Congress disapproved of an arms sale now, but its easiest move would be to buy elsewhere. Westphal has advocated for a more robust dialogue with Saudi Arabia and potentially a more forceful U.S. military commitment in exchange for a greater say in lessening civilian casualties. The Trump administration has not named a U.S. ambassador to Saudi Arabia, leaving it unclear who might foster such a dialogue.